Well-known in Germany for many years and now finally available in English! Updated in 2015, Tom Kunkler offers a complete and comprehensive guide to those climbing Mount Kilimanjaro in Tanzania. Over the last 25 years, Tom has started several companies and became well-established in the Tanzanian tourism market. He has been successfully active with a variety of projects in the Kilimanjaro region since 2006. Tom Kunkler travelled to Africa for the first time at the age of six and since then has followed his passion for travelling to over 30 countries in the world. His interests include experiencing foreign cultures, like that of the Maasai; learning survival skills and outdoor pursuits in nature, as well as various water sports and travel photography. He has lived in Moshi, Tanzania since 2007 and continues to pursue his passion and interests. 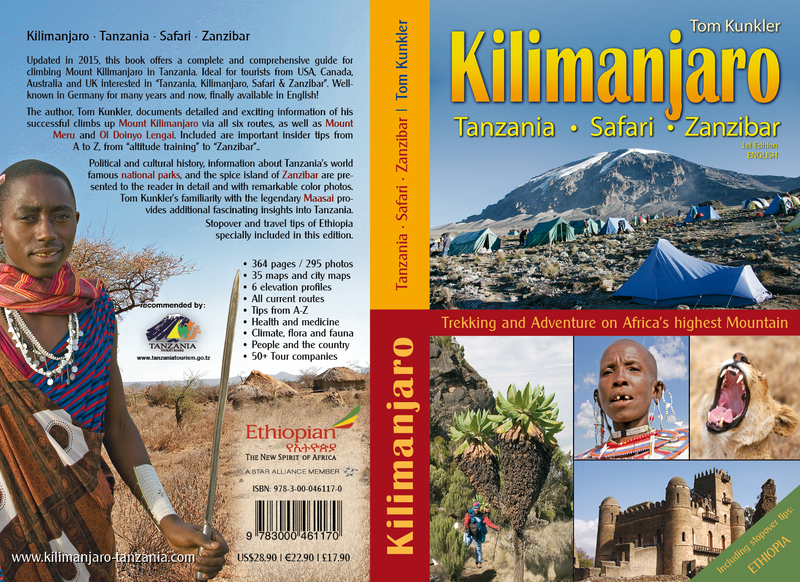 The guide is ideal for tourists interested in Tanzania, Kilimanjaro, Safari & Zanzibar. The author documents detailed and exciting information of his successful climbs up Mount Kilimanjaro (via all six routes), as well as Mount Meru and Ol Doinyo Lengai. Included is information on political and cultural history, about Tanzania's world famous national parks and the spice island of Zanzibar, all presented to the reader in detail and with remarkable colour photos. Tom Kunkler's familiarity with the legendary Maasai provides additional fascinating insights into Tanzania. Stopover and travel tips for Ethiopia are specially included in this edition. Publisher: TOKU Outdoor Consulting e. K.